Yesterday, we took a train out past Milan's suburbs and then rode our bikes to the lakeside town of Lecco. 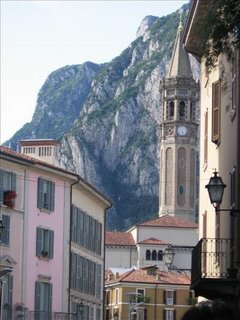 The towns around Lake Como are so beautiful since they are both on the water and among gorgeous mountains. We had clear skies, warm (not hot) weather and pretty strong breezes. A lot of the town was out in the piazza enjoying the afternoon in grand Italian Sunday-stroll style. So, we did the same. The town was full of closed butcher shops and salumerie. We passed one that had beautiful whole bresaolas. This is a meat that I never found in the States. It's a cured beef, pretty much treated like prosciutto, salt-cured but has much less fat. 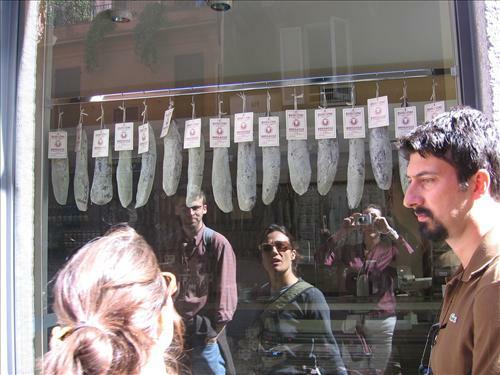 Here you see the bresaola, Valeria, Gabriel's reflection, Valeria's reflection, my reflection and Simone's profile. Then we went down a tiny pedestrian street (cars would not have fit here!) and found a dried porcini specialist. 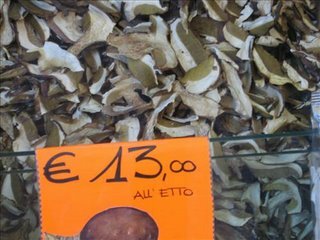 13 euros per "etto" (100 grams or a bit less than 4 ounces) Good deal? Maybe. So we got pretty hungry after the bike ride and all the food specialty shops, so we stopped at (get this name!) 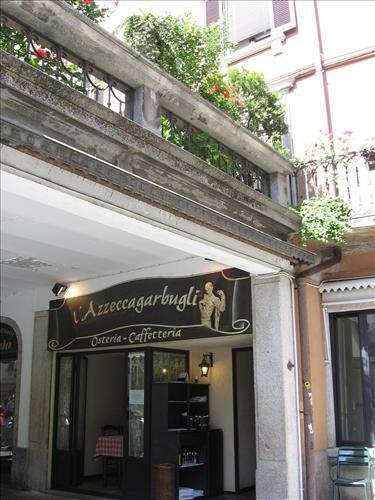 L'Azzeccagarbugli for some lunch. I have to say that, while the food was pretty good, this osteria distinguishes itself only by it's name; in other words, this ain't no promo. (Pronunciation: latz-ecka gar BULL yee) We happily ate fresh buffalo mozzarella with tomatoes, beef carpaccio, smoked salmon with butter curls and a mixed salumi plate then, sated we headed for home. That beef sounds so unusual! I know I've never heard of it! oh, susan, that post did wonders for my wanderlust. what a day for you-- especially finding the porcinis! and your meal sounded more than amazing. Hello nice to meet you, great blog. My Mum's just got from visiting her Mum in Milan and she's brought me back some lovely Porcini. I can't wait to eat them! Susan, wow, what wouldn't I give for a weekend like the one you had. I remember taking a boatride around Lake Como - some of those houses took my breath away! Mmmmmmm, your lunch sounds heavenly! Wish it was time for mine, but the only Italian joint in the vicinity is a restaurant called "Il Fornello" and it pales in comparison with the nice place you went to. Thanks for the nice pictures, too! Ivonne, Sadly our day passed Clooneyless. Lea, I'll bet it's the same place too. Lecco gets pretty cloudy and foggy in winter. Beef carpaccio is raw beef sliced paper thin and served (in our case) with shavings of parmesan and arugula leaves plus lemon for squeezing over everything. It's pretty good but not as good as smoked salmon. Lotus and Paz, But really, this place was only average and overpriced. They don't deserve the plug! You could do much better than this place (well, in Lecco). Greetings Ebbye and a.c.t. Thanks for visiting, I'll check you out soon. Rowena, I'm jealous. As Gabriel and I were riding through the country, along the Adda, we saw an abandoned farm house and half decided to buy it, renovate and become gentlemen farmers. That area is so beautiful!